I have just binned Sky and was looking for a Freesat box. 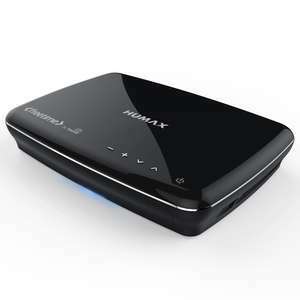 It looks like Humax have the monopoly on the Freesat set top boxes. A 500GB box looks to be usually around the £180 mark. I found this and thought I'd give it a go. It comes with a years guarantee so no different from a new one other than the shiny box. They do charge a minimum of £6.99 for delivery though. I managed to get cashback through Quidco too. Only £2.36, but it is still something. I also got 15% off using my student discount through the Student Beans app. I didn't mention this in the title because it won't be available for everyone. In total I paid £125.15 to Humax Direct and got the cashback on top. They also have the 1TB version but it is obviously more. Not sure if they still do it but when you purchase a Humax box you used to get 4 years extra warranty. Might be worth checking this out before buying elsewhere. Personally, I'd look for a used Youview box on Ebay. I bought a 500GB BT Youview box for £25 recently which gives me all the freeview channels, the usual catch-up facilities and the ability to record. Personally, I'd look for a used Youview box on Ebay. I bought a 500GB BT …Personally, I'd look for a used Youview box on Ebay. I bought a 500GB BT Youview box for £25 recently which gives me all the freeview channels, the usual catch-up facilities and the ability to record. Second that, have had a free view humax box now for about one year, absolutely faultless, paid about £70 brand new from eBay. Ok, so not an amazing deal but thought I would post it to appeal to people like me that are only concerned with the bottom line. I do like the sound of the 2 year warranty for a new box but I'm a poor student. I bought a used Freesat box off EBay a few years ago and it didn't go well. That is why the 12 month guarantee appeals to me here. I would love a cheaper Freeview box but where I am the Freeview signal is awful. I can only get the very basic channels. It is like the old days when we only had 4 channels here. This one doesn't have the hard drive built in. You are all making me jealous with your Freeview/Youview signals. Our nearest transmitter is a relay transmitter so isn't up to much. we have one, compaired to a sky box. its pretty crap.. I suppose you get what you pay for. Sky get money every month from subscribers so have to justify the fees. I agree though. The menus and such aren't a patch on Sky. thanks, how did you get around the channel changing, as magic eye will no longer work? Freeview gets less channels in quite a large portion of the UK. thanks, how did you get around the channel changing, as magic eye will no …thanks, how did you get around the channel changing, as magic eye will no longer work? Get a global tvlink plus and use original magic eyes. I suppose you get what you pay for. Sky get money every month from …I suppose you get what you pay for. Sky get money every month from subscribers so have to justify the fees.I agree though. The menus and such aren't a patch on Sky. Both of mine seem OK. Apologies - I hadn't noted that this was a freesat box and just assumed it was freeview. Apologies - I hadn't noted that this was a freesat box and just assumed it …Apologies - I hadn't noted that this was a freesat box and just assumed it was freeview. Not a problem was just highlighting freeview isn't yet nationwide, here in the lake district we get only half of the muxes so no alternative to a dish just yet. I have a humax box, the display failed after 3 years, but it does still work. My favourite feature of these boxes is the customisable skip forward/back button. It makes skipping the ads on your recordings a cinch! No idea about TV boxes but any recommendations for a freesat recorder that's fast with a nice user interface and well supported? Having two video outputs and ability to record one Chanel and watch another would also be a bonus. Id spend up to £250 if it was going to last. Or any trustworthy sites you clued up guys could point me at? Freeview is terrible in my postcode btw so has to be freesat. I have this same box and bought it refurbished. Really nice piece of kit. Can record 2 channels no problem. Shame none of these newer Humaxes have custom firmware any more - allowing you to decrypt HD recordings for copying onto tablets, skip ads, control via web, etc. You are not alone-I could fry eggs on mine! Slows down and takes 8 seconds to work out series record. And this despite the fact that on this model the power supply is outside. I'm very disappointed compared to my previous Humax box. Can it record 2 channels at once and can you transfer stuff from its HD to another HD?